The Spider Courage Experience is the fun way to get over your fear of spiders! Run by Creature Courage, the animal phobia specialists, we will help you gain control over your emotions so you can confront a spider with confidence! Get rid of the anxiety for good! Featured on Good Morning Britain, Sky News, BBC Radio, ITV and many more, we are the revolutionary spider phobia treatment taking the nation by storm! We run a 4-hour workshops to cure your phobia in a fun group setting. 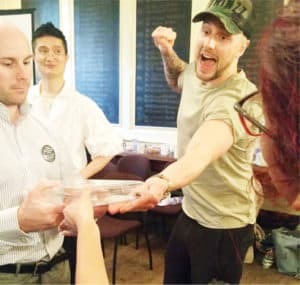 You will learn several courage building techniques using unique specially adapted psychology techniques based around hypnosis, Neuro-linguistic programming, Cognitive behavioural therapy, education and immersive therapy that will give you the confidence to beat anxiety far beyond just the spider phobia.